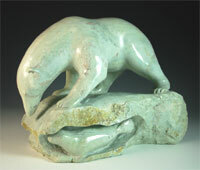 9.75" L x 4.50" W x 7.50" H"
Carved out of white quartzite with orange/brown veining, this one piece work of a Dancing mother bear and her cub by Jorgen is a most unusual and striking piece. Nokalak selected an off-white piece of dolomite with black horizontal striping to accentuate the forward motion he wanted to build into his work. 10.5" L x 2.75" W x 6.O" H"
Nokalak carved this large bear out of white island dolomite. 13.25" L x 6.50" W x 6.00" H"
A more primitive type of carving by an elder using just hand tools -you can see his file marks on some of the stone. John's old world family life scene has an Inuk making supper with a polar bear prowling around a seal carcass outside.